As a new driver, you should always be prepared to encounter any number of possible situations. Some will be scary, some will be annoying and some will be downright infuriating. However, there is one particularly traumatic driving situation that your driver’s education course likely didn’t prepare you for: The possibility that you could hit an animal with your vehicle. Although it isn’t often spoken of, most states have a law that requires you stop and call 911 if you hit a domestic animal. Pets are considered personal property, which means that if you leave the scene, you are essentially carrying out a hit and run. 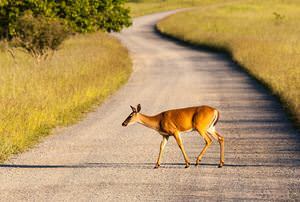 These laws usually don’t usually apply to wild animals, but stopping is still a good idea. From an ethical standpoint, it’s simply the right thing to do. From a personal standpoint, you should at least stop long enough to check for damage on your vehicle. Your immediate reaction after you hit an animal on the road will depend on where you are when the accident took place. If you’re on a quiet neighborhood street in the middle of the night, it’s best to stop where you are, put on your emergency flashers and look around the front of the car for the animal, who could possibly be trapped beneath the car. However, safety should be your number-one priority, which means that if you’re on a busy street with plenty of traffic, you will need to pull over to the side of the road before taking any action. Prepare yourself emotionally before you get out and look. What you’re about to see will probably be pretty upsetting. If you can safely locate the animal, try not to move him unless there is immediate danger. If he is on a busy road and will likely be hit again, wrap him in a blanket or jacket and carefully move him to the side of the road. If there is serious bleeding, apply pressure to the wounds while you wait for help to arrive. As with humans, doing this could potentially save a life. If you can locate the owner after the accident, the injured animal can be transferred into his or her care. If the animal was a stray or the owner can’t be located, you have a big decision on your hands. Be aware that in most states, if you take possession of an injured animal, it is your legal responsibility to provide medical treatment. You may feel guilty leaving the hurt creature for the authorities to deal with, but if you can’t afford proper veterinary care, this is probably what you should do. There may be legal consequences after hitting an animal, either for you as the driver or for the owner of the pet. In most areas, people are not legally allowed to let their dogs loose because it can cause an accident. Therefore, if you suffered damage to your vehicle as a result of hitting a dog that was running free, you may have a case against the owner. Likewise, if you were driving recklessly or were under the influence of drugs or alcohol at the time of the accident, the owners may have a case against you.